Debut album by the new four piece outfit coming out of Sweden. 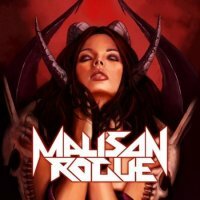 Malison Rogue is a new four piece outfit coming out of Sweden. The band were drawn together from four guys who shared a passion for music especially the 80's heavy and hair metal scenes. They have spent their last five years practising and rehearsing, touring and recording demo tracks. After the years of hard work and defining their sound, the band has finally signed a record deal and has now unleashed their first self titled album. The band consist of Zeb (Sebastian Jansson - vocals), Bjoerkborg (Jonathon Bjorkborg - guitar), Pete Fury (Petter Fura - bass) and Doc (Jens Vestergren - drums). The band has also recently announced the signing of guitarist Mats Johansson as an addition to the live band. The album is produced by Mats Leven (ex Yngwie Malmsteen & Treat) and mastered by Micke Lind (Dio, Talisman). Malison Rogue opens the album with a track which the band themselves admit sums them up the best. 'Friend Or Foe' is equally powered along by the bass and drums as it is the guitar and sits perfectly in that 80's sound. This is an early indication of what can be expected from the rest of the release and is the most memorable number from it. There is the fast paced, very Maidenesque 'We're All Born Sinners', complete with wails, pounding drums and bass. Zeb also manages a highly commendable Brucie impersonation elsewhere on the record. The band also have a progressive streak which shows itself on the grand track 'Scars', a complex number complete with cello and a choir. Even the lone ballad 'My Mistakes' has a varied composition building to chugging harmonic climax. Malison Rogue even manages to fit some female vocals into the closing epic 'Everything Fades'. This is a more than competent debut but it will very much depend on your taste in music as to whether this will be appreciated by you. The production is well done and the album is clear and every member of the band is audible through the record. The songs have a variety of pace to keep it interesting and are well written. They are also well performed; the length of time the band have worked and been together clearly shows. However, bar 'Friend Or Foe', none of the songs are instantly memorable nor sit with you for days. The band defines their sound as heavy metal with a progressive twist which on the surface would appear a suitable description. That is if you are of the opinion that the likes of Skid Row and their first album is heavy metal. However, if Skid Row's second album, 'Slave To The Grind', is more what you have in mind as heavy metal then this will come across as too light and nothing more than hard rock. The term heavy metal for this band is open to debate. Now 25 or so years later, many of the songs of that era and sound which seemed heavy back then would only be considered hard rock if released now. Malison Rogue's first effort falls foul of this changing definition due to nailing their sound so well. The band states a passion for 80's metal and that is totally prevalent in every song. On this basis they have achieved what they set out to do and should be applauded. The down side to this achievement is it risks limiting the band to a very specific target audience. Those that love that 80's hair metal sound along with the likes of early Maiden and Skid Row will all find something of joy in this album. For the progressive metal lovers there is a flavour of Queensryche and even simple Dream Theatre in some tracks. But for everyone else, especially the younger generations this music may be too firmly planted in the past to be of interest. You can sometimes get around being so retro if you don't take yourself too seriously, such as Finnish band Reckless Love, making it fun and retro. But when done seriously, it's likely only long-time lovers of the genre will appreciate it. If you were in the mosh pits to Maiden, Crimson Glory and Judas Priest in the middle of the 80s, this at the very least should leave you with a smile on your face that something so new sounding so old. To fans of other genres and styles of metal there may simply not be enough new here to truly engaged you.